The “Snow Dome” was opened in October 2006 in Bispingen on Lüneburger Heath. 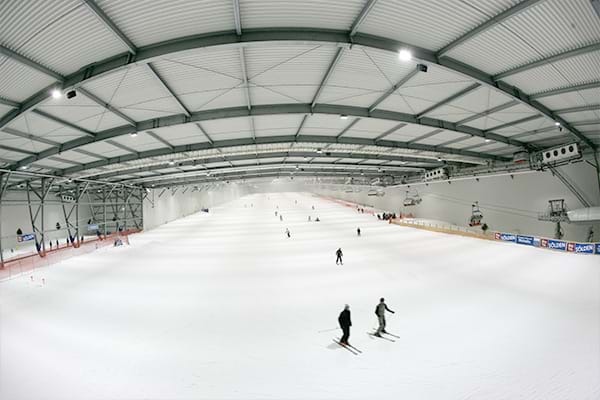 The 35 million euro project offers the best winter sports conditions on a snow surface spanning 23,000 square metres. The steelwork company Unger of Oberwart, Austria suggested and implemented the chosen support system for the construction of the roof within the complex. The construction weighs 3,500 tonnes. ZINKPOWER Calbe hot-dip galvanized all steel components. As with a bridge construction, the roof supports within the complex were suspended on the outside framework pylons using two anchoring devices so that the complete width of the hall could be freely straddled. This required a total of 62,000 bolts and the roof construction is characterized in particular by its effortlessness despite the 16,000 steel components used.